Between sunbathing on the Jersey shore with his nouveau-riche cronies, Caroline Manzo of the Bravo TV "Manzo'd With Children", convicted felon on probation, Bernard Kerik, took a break with the peasants this week to exploit the homeless for some self-promotion on Huff Post Live. During this dribble (24 minutes of my life I'll never get back! ), convicted felon Bernard Kerik admits he doesn't know about Section 8!! Now you think a proud alumnus of SUNY Empire State College class of 2002 with a BS bachelor's degree in "Social Theory Structure and Change with a concentration in public administration" would have heard of Section 8?! 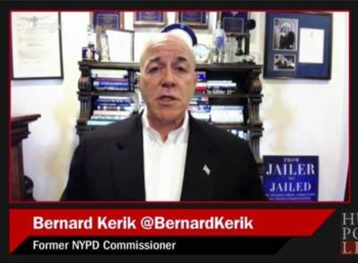 Felon on probation, Kerik, also regales us with such elegant phrases as "You can't let dem off da hook neither".... Now there's some professional broadcast journalism for ya! Among the homeless on the New York City streets are mentally ill. To add insult to injury the pretty but ignorant host, Zerlina Maxwell, never challenged former Corrections Rikers Island Commissioner Convicted Felon, Bernard Kerik. You see if anyone cares about documented history, Corrections Commissioner Bernard Kerik, back in his corruption, adultery and fornication days, was forced to "segregate" the mentally ill into solitary confinement in order to settle pending law suits NYC Legal aid filed against NYC over the beatings and harsh treatment of inmates. In fact, 1999 Murns v NYC was a notable law suit involving mentally ill and drug addicted inmate, Susan Murns, who committed suicide by hanging herself after her medical history and concerns were ignored on Bernard Kerik's watch. I guess that was so long ago. Why interrupt some great hype and self-promotion with the FACTS and a documented record of abuse! I guess the HuffPostLive puts the "huff" in journalism these days.....So the homeless are no better off. Convicted felon Bernard Kerik, puppet of the Ed Mullins and the pathetic, greedy, forever-whining, NYPD Police unions, continues self-promoting and get a free dig at Mayor Bill DeBlasio. HuffPostLive pretends to be news source. Everybody Plays, Everybody Wins.